A mix of patterns on a Prada coat. It’s no surprise that the SoHo Prada store is celebrating the exhibit Schiaparelli and Prada: Impossible Conversations at the Met, and, even better, these windows were styled by Grace Coddington, Creative Director at Vogue (whose memoir, by the way, will be released this November). Mask by Julien d'Y's, whose work I always enjoy. I enjoyed seeing the Prada clothes on display at the Met, and I consider myself a big fan of Prada, but I was a bit taken aback when shoes that are current season Prada—I’m thinking of the ones that look like hot rods on heels, with “taillights” on the back, that originally retailed for nearly $1,500—were included in the exhibit. It seemed a little too advertorial to me. There is a huge difference between clothing that is interesting because enough time has passed to make it historical—Schiaparelli dresses from the early 1930s, say—and clothes that you can buy today, this very moment. 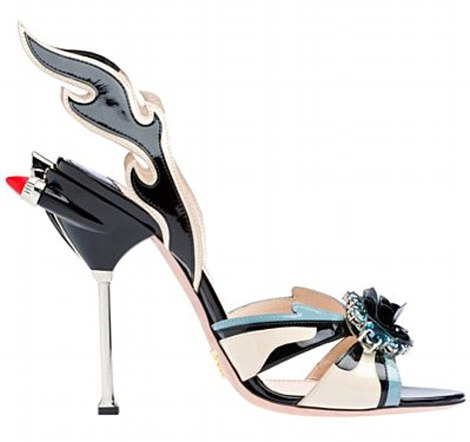 The Prada shoes may be collector’s items but are they museum-worthy? Give them 80 years and get back to me! These shoes are featured in the Schiaparelli/Prada exhibit at the Met. Are they museum-worthy pieces if you can buy them today? But don't think for a second that I'd pass up a chance to try these on. I hope that everyone that goes to the Met just to see Prada will take the time to learn about Elsa Schiaparelli and appreciate her place in fashion history. Your intrepid photographer and her assistant contemplate Prada platforms. Schiaparelli and Prada: Impossible Conversations runs through August 19, 2012. Ha! Yes, that is way too much advertising for me to take seriously, but at least those shoes are fun. It makes it okay. Mostly! Meanwhile, I'm all excited for November and the memoir coming out. I (like everyone) adore Grace Coddington, and reading her story would be a delight. Thank you for all the wonderful eye candy this morning! Hi Catherine! I was very interested in the Schiaparelli clothes and accessories, but I had a hard time connecting with the Prada pieces because I recognized so many of them as either current season or just from last year. I do think placing the two of those designers together was a good curatorial choice, they do have interesting similarities, but I wish they would've limited Prada's contributions to her older work, not stuff I can buy today on sale at Bergdorf's! I always learn things from you, Jill! And cute assistant BTW! I'll really look forward to that Coddington book. I'd have to agree about including current season items in the exhibit, but isn't Prada the one who doesn't find fashion an art form? I love Prada and am a huge fan. I have a Prada wool coat that was an extravagant purchase, and it brings a smile to my face each time I wear it. I really like her point of view. Hi Jill (and hello cute little assistant)! Always interesting and informative post from you. Thanks for sharing! I used to buy clothes, bags, belts and shoes from Prada. They used to be of good quality. I bought only classic pieces, not those that are too "at the moment". However, my 2 last bags are very disappointing. 1 has rusty zipper after 2 weeks without any usage the other has broken handles. After sales service took 2 months to settle the problem. So I stopped buying anything from them. But my love for Schiaparelli is forever unchanged :) She is so talented and her work are inspiring all the time. Hang my dear, I can't tell you how glad I am to hear you talk about your love of Schiaparelli! I could not get over how many people I have heard recently say they don't know who Elsa Schiaparelli is. What? Are you kidding me? How is that possible? An online paper interviewed people going to the Met exhibit, and almost all of them were there to see Prada, which just floored me. Prada owes SO MUCH to designers like Yves Saint Laurent (which she will admit to) and Schiaparelli (who she claims she never used as a reference point. I remain a tad skeptical on that comment.). I'm a big fan of Prada but she and others need to dig a little deeper when thinking of fashion history.